Origin, a new open platform for additive mass production, announced today it secured $10 million in Series A funding led by Jason Krikorian of DCM. The company previously raised $2.3 million from Floodgate, Stanford University, Joe Montana, and other investors. With this round, Jason Krikorian joins Mike Maples, Jr. of Floodgate on Origin's Board of Directors. The company also announced a new partnership with BASF, one of the largest chemicals producers in the world, to develop material for Origin's "open additive production" platform, which includes extensible software, modular hardware, and world-class materials from BASF and other partners. Until now, additive manufacturing has been dominated by closed and inflexible systems with material only available from the printer manufacturer. Even systems described as having "open materials" are limited. The materials are confined to existing chemistries and heavily constrained by the print process. Origin is reshaping additive manufacturing and creating an open ecosystem, with new chemistries that will allow choice and product customization so companies can scale and meet demand in their market with the material of their choice. The partnership between Origin and BASF is already bearing results. Working closely with BASF over the last year, Origin has developed a new print process for BASF's new photopolymers that produces a combination of surface finish, mechanical strength, and throughput that is unmatched in the industry. "Origin is poised to bring additive manufacturing beyond the current confines of prototyping to make a significant impact on the $600B plastics market," said Jason Krikorian, General Partner at DCM. "We are strong believers that an open approach to materials will be key to unlocking the mass manufacturing potential of additive, and it's great to see BASF as the first example of an industry leader to formally embrace the platform." "This is just the start of our partnership with BASF," says Chris Prucha, Origin CEO and Founder. "We're excited to work with BASF to launch new materials that will go way beyond what's available today, and unlock high volume additive production. Our open network approach with BASF and other material partners will fundamentally reshape manufacturing and global supply chains." With Origin's flexible printing process and BASF's new photopolymers, customers can achieve a rare combination of customization, strength, and throughput that surpasses anything on the market. Parts like this 21 x 21 x 114 mm textured sample can be rapidly printed and post cured in a range of custom textures and colors, with the mechanical strength required for a high volume manufactured part. "We're really excited about Origin's open platform and are investing a lot in this partnership," said Arnaud Guédou, Business Director of Photopolymer Solutions at BASF 3D Printing Solutions GmbH. 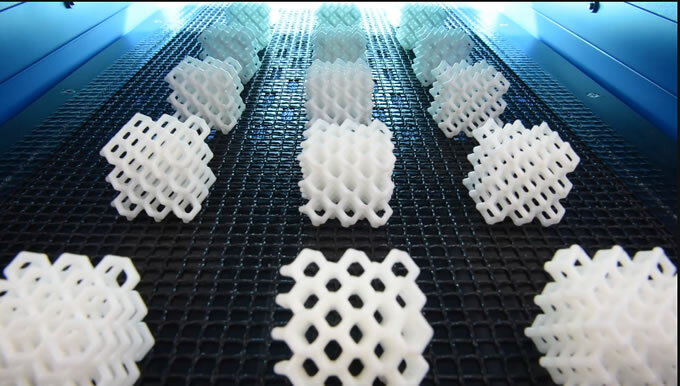 "We plan to work with Origin to optimize our photopolymers and other additive materials to create a whole series of new options for high volume manufacturers." Visit BASF's booth 3.1-F20 at Formnext next week to learn more, pick up a sample of a new BASF photopolymer printed with Origin, and see other parts produced with Origin's system and BASF's photopolymers. At BASF, we create chemistry for a sustainable future. We combine economic success with environmental protection and social responsibility. The more than 115,000 employees in the BASF Group work on contributing to the success of our customers in nearly all sectors and almost every country in the world. Our portfolio is organized into four segments: Chemicals, Performance Products, Functional Materials & Solutions and Agricultural Solutions. BASF generated sales of more than €60 billion in 2017. Further information at www.basf.com.